I do not miss dairy ice cream. Usually it's full of chemicals, drugs, antibiotics and unhealthy fats. Even if that doesn't bother you - it's an abusive industry that steals baby food from another species. That's mean and weird. But if you don't consume dairy then how will you survive without ice cream!? Do not fret: because I have something better (in every possible way). It's raw, vegan, healthy, creamy and equally delicious. Especially if you like coconut. If not, still no need to cry over spilled coconut milk; you can adjust the coconut flavour to your liking. 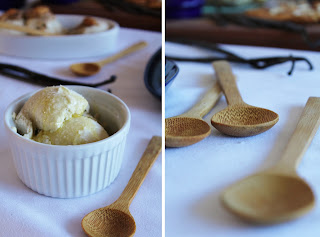 Today I have two majorly delicious recipes for you. The first I am sure everyone can enjoy, it is a vanilla bean coconut ice cream with a caramel swirl. The second is slightly less known but believe me - one of the best ice creams I've ever tasted. It is olive oil ice cream. I know, it sounds strange but I wouldn't joke about ice cream. It's outta this world. I had heard about it before and finally decided to face my skepticism and make it. 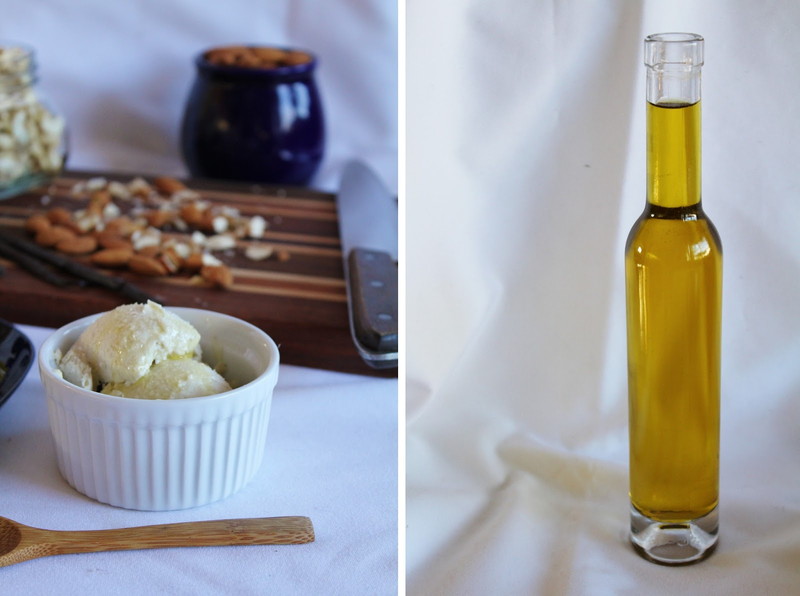 It's hard to imagine the flavour of olive oil and ice cream complementing each other but as you taste you have an epiphany. I did, anyway. The sweetness of the ice cream picks up the fruity tones of olive oil and the olive oil provides extra creaminess and a savoury layer of flavour to the ice cream. I'd say I just created a new pair of best friends. Apparently olive oil ice cream is pretty normal in places like Italy, which is not surprising when you think about it. Why not, right? Food is about experimentation and discovering new favourites! I didn't calculate the nutritional information for this recipe because... well, I never do, since I don't think that it is important. As long as your diet is comprised mostly of plant-based whole foods, you're golden - and this recipe fits that category. Having said that, the fat content is probably quite high for this one so just make sure not to eat much other fat in your day. To make the vanilla ice cream: in your high speed blender, blend all the ice cream ingredients - EXCEPT the olive oil - until smooth and deliciously addictive. Add what you think it needs then pour about half of it into a freezer safe container. Set aside. To make the olive oil ice cream: add the olive oil to the remaining ice cream mixture in your blender and blend until it is incorporated. Now the moment of truth - taste it. AMAZING, RIGHT? Put this into another freezer safe container. If you have an ice cream maker, I'm jealous. Use it according to its instructions for each ice cream (separately). If you want a caramel swirl in your vanilla ice cream, gently stir in the caramel by hand when the ice cream is the consistency of soft serve. If you don't have an ice cream maker (like me), put each container into an ice bath until cold. Then put them in the freezer and stir them every 30 minutes until frozen. Same directions for the caramel swirl as written above. Serve with chopped nuts and sprinkle with salt. This sounds amazing Emily! 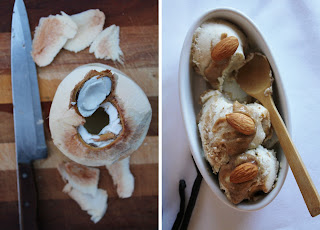 I love the idea of olive oil in ice cream...especially coconut! The caramel just puts it over the top, one of my favorite things in the world ;). And, who cares if the fat content is high...good oils are healthy :)! Thank you, Amy :) I'm with you on that one! How else does a girl get glowing skin and shining hair? Haha I understand the skepticism, but try it anyhoo! Ice cream is one of my most favorite foods, so I'll have to give these recipes a try!! Just a tip, if you don't have an icecream maker, a faster way to beg it to freeze would be putting it in a freezers bag or container that will fit inside a larger one, something like a large coffee container is perfect. Fill it with ice and roll ir around or shake it for about five mins and vwala! Oh thanks a lot, Monica :) I'll try that next time. This looks so amazing! I absolutely love your blog- it's awesome! I'm from Vancouver, too! It's always fun to see other Vancouver food bloggers....especially raw or vegan! So excited to keep up with The Rawsome Vegan Life! Thanks so much :) Woohoo! Whereabouts? Thank you. Tell me how it goes! Can I skip coconut oil or substitute it with something else? Yeah! Just don't add it at all, or use nut butter. yumm!! definitely will try! by vegan milk, do you mean any milk substitute (soy, almond, ect....)? Question about the units for the coconut oil: is that supposed to be 1/4 cup? Or is there a way to obtain oil from a quarter of a coconut that I'm missing? Thanks! Man, olive oil ice cream...I can't even imagine what that would taste like, but I'm definitely willing to try it! Hi! I was just wondering if all extra virgin olivd oils were raw? What about coconut oils? @Sophie Maki - virgin cold pressed oils are not exposed to high heat. I do not know if they are heated to above 115 degrees, but in any case it's pretty gentle so I am okay with it. For years now I've had a somewhat intrusive thought of owning a vegan iceccream shop, ha! These flavours would do very well in that magical place. Will have to try that both of these ASAP! My partner is obsessed with olive anything ^-^! And you are a GENIUS keep sharing for a long time pppplllleeeeaaassseee!